All aquarium fish produce toxic ammonia as a biological waste. In a healthy freshwater tank, various beneficial bacteria break down ammonia into less toxic nitrogen compounds. However, this process can fail. You should understand the symptoms, effects and methods of controlling ammonia. Ammonia is directly toxic to aquarium fish. For one, it causes chemical burns to fish tissue. It generally hurts the gills first. Even as ammonia burns the gills, fish absorb it into their bodies, where it can damage other tissues. The damage to the gill also causes other problems. This damage makes it harder for the fish to respire. At the same time, damage to the gills makes it harder for fish to excrete ammonia, causing it to build up further. 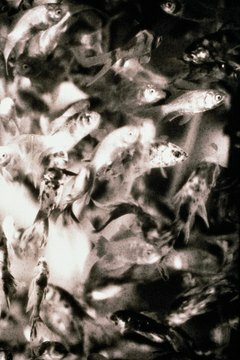 On top of direct damage to fish, ammonia causes problems to aquarium water chemistry. While ammonia itself is a base, the biological processes associated with producing and breaking down ammonia create hydrogen ions as a byproduct. This can quickly lower aquarium water pH. Oddly, a low, or acidic, pH makes ammonia slightly less toxic. However, this change is not sufficient to protect fish from ammonia. Fish poisoned by ammonia display a number of symptoms. Fish exposed to ammonia tend to move with jerky, darting movements. Depending on the level of ammonia in the water, fish might become lethargic and hang out near the bottom of the tank. You may also see signs of gill damage. You may see fish "gasping" at the surface of the water and rapidly flapping their gill covers. These symptoms are attempts by the fish to compensate for the damage to their gills. Several practices limit ammonia in freshwater aquariums. Avoiding overcrowding, avoiding overfeeding and immediately removing dead fish, plant matter and leftover food help. Also, you want to add fish to your aquarium slowly. Add a few fish at a time, and monitor the levels of ammonia and nitrite. Once these levels reach zero, perform a 25 percent water change and add a few more fish. Test for ammonia weekly and perform monthly water changes to keep ammonia in check.